Melbourne’s very own Crown Casino is the largest land-based casino in the Southern Hemisphere, and originally opened in 1994 on a temporary location, before being moved to the south bank of the Yarra River and being reopened in 1997. 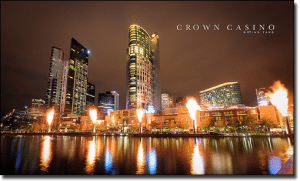 The most popular tourist attraction in Melbourne and Australia, and ranked inside the top 20 most popular in the world, Crown attracts approximately 18 million people a year. The casino itself remains open on all days, aside from Anzac Day, Good Friday and Christmas. The entire complex, which also boasts hotels, event ballrooms, countless restaurants, nightclubs, an electronic games arcade, a bowling alley, multiple retail stores and other facilities, occupies more than 510,000 square metres, which is the equivalent of two city blocks. Crown makes approximately $1.6 million in profit each day, contributes more than two billion dollars per annum to the Victorian economy, and contributes around the 350 million dollar mark in taxes to the Victorian Government each year. The complex welcomes more than 45,000 patrons each day, close to 100 languages are spoken by Crown employees, and there are three hotels – The Crown Towers Hotel (owns 481 rooms), The Crown Metropol Hotel (owns 665 rooms) and The Crown Promenade Hotel (owns 465 rooms). Patrons of all ages can enter the Crown complex, however people under 18 years of age are not allowed to enter the gaming area or areas serving alcohol. Inside the multi-level casino, there are more than 2,500 gaming machines (slots, also known as pokies) and over 500 tables games. The pokies machines offer betting limits which range from $0.01 per spin to $1 per spin, while in the VIP gaming areas, some machines allow for a maximum of $5 wagers per spin. Machines are powered by gaming developer such as Aristocrat, International Gaming Technology (IGT), Ainsworth Gaming Technology (AGT), WMS Gaming and Konami. Electronic versions of games such as blackjack (Rapid Blackjack), roulette (Rapid Roulette) and baccarat are available to play, and demonstrate just how influential the advent of online gambling has been on brick and mortar gaming venues. The electronic table games, which utilise some of the latest gaming technology, hold lower house edges than their respective authentic counterparts, and are becoming more and more popular among patrons. 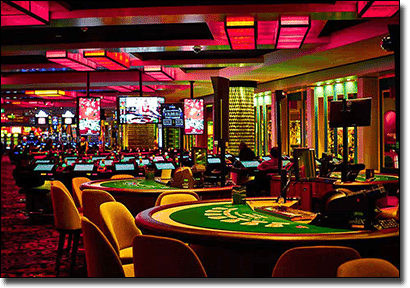 Crown also plays host to some of the most prestigious competitive poker tournaments in the world, including the Aussie Millions (the Southern Hemisphere’s richest poker event) and the World Series of Poker Asia-Pacific – an expansion of the WSOP. It boasts over 100 official poker tables (the largest poker room in Australia), where you can partake in a variety of cash games such as Omaha and Texas Hold’em. Crown also runs practice games, where you can learn the basics to most games. These games are held at pre-set times, and only if enough interest is shown. Crown Casino is regulated by the Victorian Commission for Gambling Regulation (VCGR), which monitors the casino’s operations to ensure games and services conform to the strict Victorian Gambling laws. One of the most remarkably designed and captivating complexes in the world, Crown and its casino offer high quality services to its patrons, and boasts some truly elegant features, such as ornate modern ceilings, water features, and the iconic spheres of fire which light up the night sky every hour, and are nine feet in diameter.